Victor C. Rogus shared with SPACE.com photos of his latest batch of space-themed carved pumpkins for Halloween 2013. Rogus resides in Jadwin, MO. One space fan is getting into the Halloween spirit. Night sky photographer Victor Rogus has carved a series of spooky space pumpkins or "astropumpkins" in honor of Halloween on Thursday (Oct. 31). Rogus' four pumpkins take the shape of familiar celestial objects. He carved the sun, moon, the potentially dazzlingly Comet ISON and a group of planets into four large Dill's Atlantic Giant pumpkins, which he grew himself in Jadwin, Mo. The sun pumpkin, weighing in at more than 200 pounds (90.7 kilograms), has a smiling face surrounded by triangles of light that look like sunbeams. Rogus didn't carve completely through most of the pumpkin, instead opting to create detailed, semi translucent patterns in the pumpkin's flesh. He used this same method to create the ethereal moon pumpkin as well. The half moon's smiling face is also set against an intricate pattern with stars carved out, letting the light on the interior of the gourd shine through. 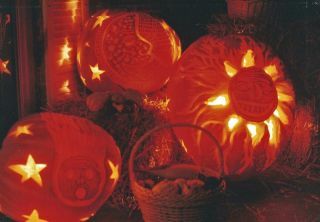 The pumpkin named "The Planets Among The Stars" features various faces carved out in somewhat familiar jack-o-lantern shapes. On another astropumpkin, ISON — set to make a close brush with the sun at the end of November — looks surprised and somewhat ghostly as it hurtles across the gourd's face. Rogus isn't the first person to carve up some space-themed fun for Halloween. NASA employee Liz Warren has crafted some unique holiday pumpkins in the past. Last year, she used her carving abilities to honor one of the biggest space stories of 2012 by carving the façade of the space agency's Mars rover Curiosity onto a pumpkin. "I carved a Curiosity design this year because in August of this year, that mission truly captured the imagination of the world in bold NASA fashion," Warren told SPACE.com last year. "They dared a mighty thing and they succeeded." Use a simple pattern you can find online, and make sure the image is black-and-white to bring out the major features. Print the image out and cut out the white, blank spaces. Put the template on the pumpkin and trace the cutout and then get to carving. Have fun with it. Editor's note: If you have an amazing space pumpkin or cosmic Halloween costume photo that you'd like to share for a possible story or image gallery, please contact managing editor Tariq Malik at spacephotos@space.com.